At the Artisan Shop in Loveland, we’re proud to provide our customers with high quality custom kitchen cabinetry that fits their unique needs. Our cabinetry professionals believe that cabinets are the focal point of your kitchen, and they should reflect your personal style while providing ample functionality. When you combine all the benefits of custom kitchen cabinets, you’ll understand why a majority of homeowners choose us to help them design and build the kitchen of their dreams. All of our custom cabinets are built by hand from our skilled and artistic cabinet makers. Our professionals take pride in their work and use only the highest quality materials to turn your kitchen into a work of art. Custom cabinets are built to last, unlike cabinets found on retail assembly lines, and will provide classic beauty and functionality for years to come. If you want your custom cabinets to be created from local Colorado wood, our designers have the ability to source it. When it comes to creating your custom kitchen cabinetry, you’ll have a much broader choice of materials to choose from, including local or domestic hardwoods that have a lesser impact on the environment. 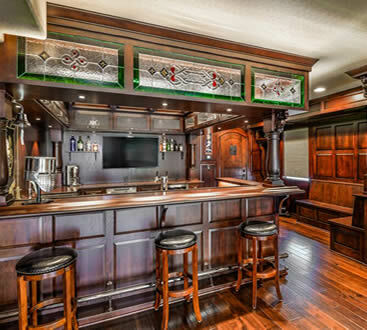 When you work with the professionals at the Artisan Shop, you have total control over the design and materials used to make your custom kitchen cabinets. If you have a tall family, we’ll work with you to design tall and functional cabinets so you don’t have to constantly bend over to cook in the kitchen. If your family is short, on the other hand, we’ll look into smaller cabinets to ensure we install your countertop at the perfect height. You’ll also have the ability to select from a variety of unique and trendy cabinet and drawer combinations to fit your personal style. 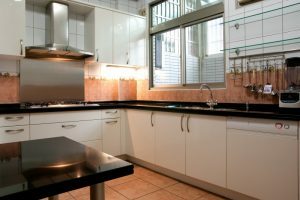 While purchasing kitchen cabinets online might seem convenient, you may still have limited options due to product availability. Stock cabinets are created from assembly lines during different times and can often result in non-matching components. When you work with a custom cabinet company, you’ll be able to personalize every detail of your kitchen, from wood and style to finish and hardware. If you have an unusual kitchen layout or floor plan, stock cabinetry can provide a variety of problems. Firstly, if you order your kitchen cabinets from an assembly line, you’ll have to resort to their preset sizes and dimensions. This means if your cabinets don’t properly fit where you hope they will, you’ll have to go through the hassle of returning the hardware, ordering different cabinets, and installing them again. Custom cabinets can be built to accommodate any size kitchen, and will give your kitchen a fitted and neat look, while providing optimal functionality. If you’re looking for a dependable and professional custom cabinetry company in Loveland, the experts at The Artisan Shop are here to help. Our experienced designers and artisans work with today’s modern craftsman technologies to create beautiful and award winning projects right in your home. Contact our professionals today to learn more about how we can help turn your kitchen into a beautiful work of art.